As temperatures soar this week doors and windows will be open to let some fresh air in, but how do we stop ants from taking over our homes? 1. Cover all food to prevent it from attracting ants into your house. 2. Keep bins as far from your windows and doors as possible. 3. 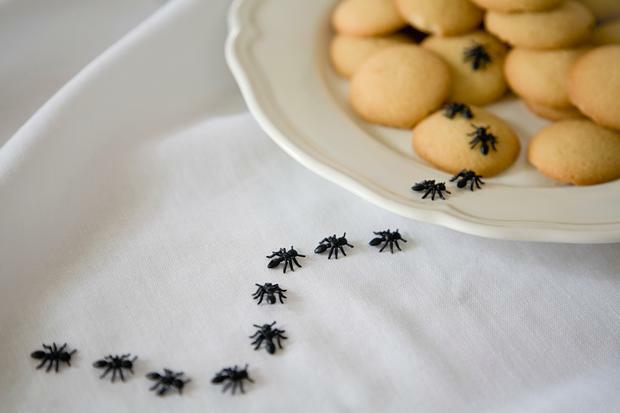 Don’t allow moisture to accommodate on counters and other surfaces, as ants keep looking for water out wherever they can find it and stay near its sources. 5. Chalk can be used by drawing a line around entry points to your home. Ants are repelled by the calcium carbonate in the chalk. 6. A golden oldie- sprinkling flour along pantry shelves or at entry points will deter ants as they won’t cross the line. 7. Citrus fruits like lemons and oranges can used as their juice will cause the pests to flee because they hate the smell. 8. Pepper can also be used as ants scour for sugar and the pepper smell will put them off. 9. For an effective organic ant repellent, scatter talcum powder liberally around house foundations and known points of entry, such as doors and windows. 10. Vinegar is also a ant repellent as the strong smell will make the ants stay far away.